Chop the cucumber into 1cm small chunks. Take balsamic vinegar in a bowl and add olives in it. Mix the olives in vinegar for 10 seconds and add salad onions. Then add Olive oil and lemonjuice in vinegar and mix well. Now, our dressing is ready. 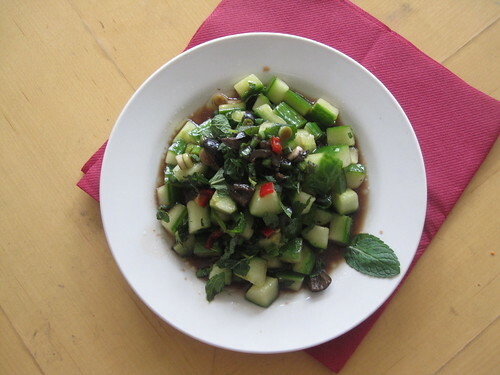 Add chopped mint and red chilli to cumcumber chunks. Pour the dressing over cucumber with little Olive oil and toss well. Cucumber salad is ready to serve. 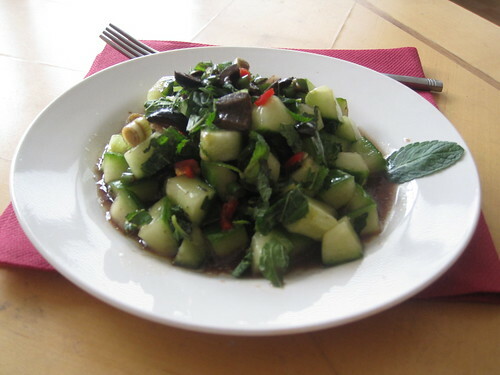 The Cucumber Salad can be served for breakfast and evening snacks. Checkout my fellow bloggers in Marathon :) which is originated by Srivalli. cucumber in a salad is always welcome! Thats a refreshing and elegant salad..
Balsamic vinegar is one of my favorite dressing ingredients-gives so much flavor to everything. Salad looks refreshing and delicious. Refreshing and flavorful salad with mints. Delectable & refreshing !! You have a nice space..following you!! Healthy and fabulous salad, yumm!